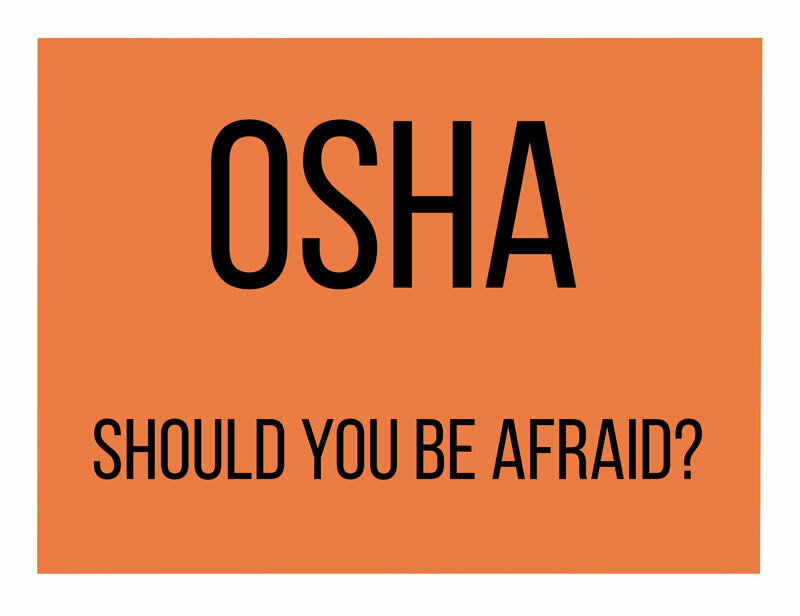 Should You Be Afraid of OSHA? It is a phrase likely to strike fear in even the most experienced of business owners: “OSHA is coming!” The Occupational Safety and Health Administration (OSHA) has a reputation for being tough on businesses when they are down, and the thought of an inspection by OSHA can be daunting. OSHA might not be the bad guys they have been made out to be, and here is why. The main focus of OSHA is in their name: “occupational safety” and “occupational health”. The mission of OSHA is “to assure safe and healthful working conditions for working men and women by setting and enforcing standards and by providing training, outreach, education and assistance” (from About OSHA). Your business wants a safe and healthy work environment for your employees to reduce employee illness or injury, downtime and workers compensation premiums. OSHA provides a wealth of training and resources by industry to help you do all of these things. One of the biggest ways OSHA can help is by performing workplace inspections. Why, then, do so many companies fear an OSHA inspection? Planned or programmed investigations. These are planned by the department, but are still surprise inspections of certain high-hazard industries and individual workplaces that have demonstrated high rates of illness or injury. Incident-related inspections. While these are still surprise inspections, the employer should be expecting an OSHA inspector if there has recently been an on-the-job fatality or catastrophe, an imminent danger situation, a complaint filed by an employee (usually anonymously), a referral from a government agency or bad press, or if there is need for follow-up on prior inspection recommendations. While an inspection can be stressful, knowing what to expect can help alleviate the situation. The OSHA Inspection Facts information sheet explains why your workplace may have been selected and what an inspection will entail. It is important to remember that OSHA does not want to shut down your workplace, and wants to work with you to resolve occupational hazards. OSHA works with the insurance industry to help employers. The thorough inspections done by OSHA have even been used to help settle insurance claims. There are over 7,000,000 workplaces in the US, in every conceivable industry. OSHA cannot possibly get to all of them. Those odds might make you breathe a sigh of relief, but a lack of inspection doesn’t mean your workplace is as safe as it could be. The OSHA website has a wealth of information for business owners on how to create and maintain a safe workplace. Below is just a small sampling of the resources available on the website. When should I report a death or injury to OSHA? On-site safety consultations for small businesses. OSHA standards for general and specific industries. OSHA is seen by many as the big, bad government out to shut businesses down, but they were created to keep businesses going by reducing workplace hazards and keeping employees on the job. Contact your insurance broker to find out more about how OSHA resources can make your workplace safer.